Consumers Energy is shifting away from coal-fired power plants to natural gas. Consumers Energy is suspending plans to start building a $700 million power plant in Genesee County. The utility announced today it will instead buy an existing Jackson County power plant for $155 million. “You know, frankly, we can look out our windows at our headquarters at Consumers Energy, look east, and see the steam when that plant is operating, which is quite often,” says Dan Bishop, a Consumers spokesman. The Jackson County power plant has been generating electricity for a decade. As a merchant power plant, it sold electricity on the wholesale market. The natural gas-fired power plant will eventually replace seven aging, coal-fired power plants. Meanwhile, Bishop insists plans for the proposed Genesee County power plant are ‘on hold’, not canceled. The Genesee County plant would have created hundreds of construction and utility jobs. Spokesman Dan Bishop insists no final decisions have been made about the Genesee County project. This is the second major power plant project that Consumers Energy has stepped back from. In 2011, Consumers announced it was dropping plans to build a $2 billion coal-fired power plant in Bay County. State regulators are going to spend the next few months assessing how well Consumers Energy and DTE responded to a massive power outage after an ice storm last month. 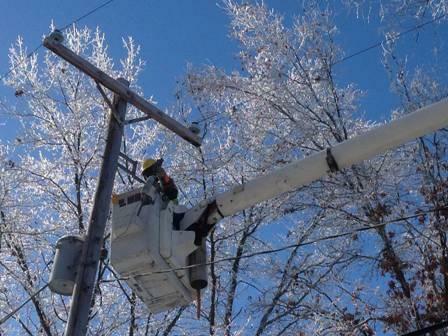 It’s estimated 626,000 DTE and Consumers Energy customers lost power after the Dec. 22 ice storm. It was New Year’s Eve by the time the utilities restored power to most of its customers.